Been looking through old photos a lot recently. I laughed for about an hour afterwards. This entry was posted in Uncategorized and tagged bungee, me. Bookmark the permalink. Crazy people do giggle a lot, I hear. I’d BASE jump before I’d strap one of those turkeys on my feet, that’s for certain. Whoa! I’d call that a little crazy, but I’m not much of a dare devil. I did consider jumping out of an airplane plane one time. Let’s just say I considered it! Kudos for you though. It must have been exhilarating! Gosh, you did it! 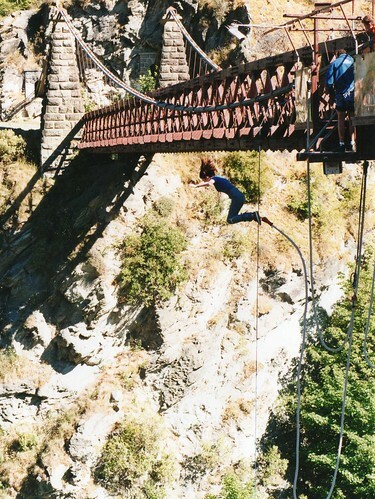 I was SO intent on bungyjumping a long time ago, decided/realised it wasn’t really me. But wow, for you who have done it and survived! I’d need to be manhandled over the side first ! Embrace that bravery, friend. It is beautiful and strong, and yes, it is you. Great photo! something I’d be too chicken to try! I think that must have been hysteria! not in a million years, but maybe for a million dollars. That looks like the bridge outside Queenstown in New Zealand where I watched one poor man try several times to jump but each time walked back from the edge. My knees quaked for him more on every attempt. Then the lovely assistant from the front desk joined him and they made it over the edge together. Good for you and your bravery. Watching was as brave as I got!